Update: Since we originally published this story GForGames has published some photos on the phone out in the wild. It looks like the phone is called the LG Class, but it's not exactly showing much in its design. The little fuss we're hearing from LG over the Class suggests it's unlikely to make it out of Asia, so we're not getting our hopes for the mid-range phablet up just yet. Original: LG has been a busy bee recently, as it teases a new phone for September 21, and that's on top of one we've heard about for another event on October 1. The new phone is pictured in the teaser and looks pretty old school – it's like the sort of phone we'd expect to see from 2011. 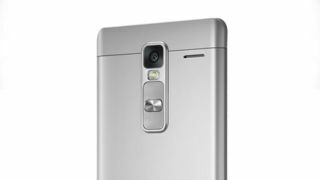 We've only seen the back of the handset so far but it's got a square camera module and the buttons are on the back in that unique LG way. A GeekBench listing for the LG-H740 showed off specs we'd speculate are this same phone including a 5.7-inch display, a Qualcomm Snapdragon 615 processor and 2GB of RAM. On top of that the mystery handset is also tipped to sport a 12MP rear camera, 5MP front snapper, 8GB of storage and Android 5.1.1 pre-loaded on the phone. That earlier teaser for an October 1 event has us confused though; we're expecting to see a phone with more impressive specs and a movie theme then, but why aren't both phones coming together? It's not quite clear why LG is planning to announce both these phones separately, we haven't been invited to an event on September 21 so it may not even be coming to the West at all.